Zebra RFD5500 UHF RFID Sled brings industry-leading RFID technology to your MC55, MC65 or MC67 mobile computers. This versatile accessory makes these mobile computers state-of-the-art handheld RFID readers that are at home in the storefront, carpeted business areas, best suited for indoor applications. With its light weight, rugged design and well-balanced, gun-style grip, the RFD5500 is suited to the most read-intensive applications. And the advanced, high efficiency Zebra RFID reader engine gives you fast read rates, high throughput "" and improved productivity in your operation. Most RFID readers offer you a choice of antennas: linear polarization for a longer read range or circular polarization for wider coverage. Zebra's patented omnidirectional antenna offers the best of both worlds – a superior read range and superior coverage area. The orientation agnostic antenna in the RFD5500 delivers extraordinary reliability and there’s no need to precisely align the reader with the tag. That means your workers can quickly and accurately capture data on even the most challenging items — from a pile of clothing in a retail store or a box of files in the office to a shelf full of data tapes in the data center. The RFD5500 adds best-in-class RFID data capture technologies to the best-in-class bar code scanning ability of your MC55, MC65 or MC67. The versatility of using two readers in a single device means employees can locate products, read non-line-of-sight RFID data, and capture even damaged and poor quality 1-D bar codes without interrupting workflow. Meanwhile, you have fewer devices to purchase and manage, which translates to a lower cost of ownership for you. The RFD5500 UHF RFID Sled brings industry-leading RFID technology to your MC55, MC65 or MC67 mobile computers. This versatile accessory makes these mobile computers state-of-the-art handheld RFID readers that are at home in the storefront, carpeted business areas or with the WAN enabled MC65 or MC67, out in the field. With its light weight, rugged design and well-balanced, gun-style grip, the RFD5500 is suited to the most read-intensive applications. And the advanced, high efficiency Motorola RFID reader engine gives you fast read rates, high throughput – and improved productivity in your operation. 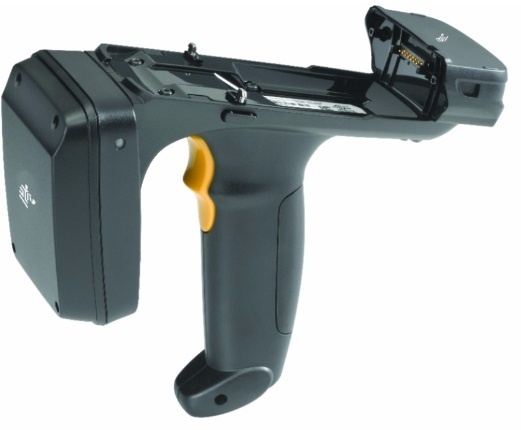 The RFD5500 adds best-in-class RFID data capture technologies to the best-in-class bar code scanning ability of your MC55, MC65 or MC67. The versitility of using two readers in a single device means employees can locate products, read non-line-of-sight RFID data, and capture even damaged and poor quality 1D barcodes without interrupting workflow. Meanwhile, you have fewer devices to purchase and manage, which translates to a lower cost of ownership for you.